In Augusto's words to the judges, "it's almost not Christmas without caroling." The goal of the Carol-oke project was to allow everyone on the floor to carol together, without actually interacting with other people, which would violate the computer science code of ethics. 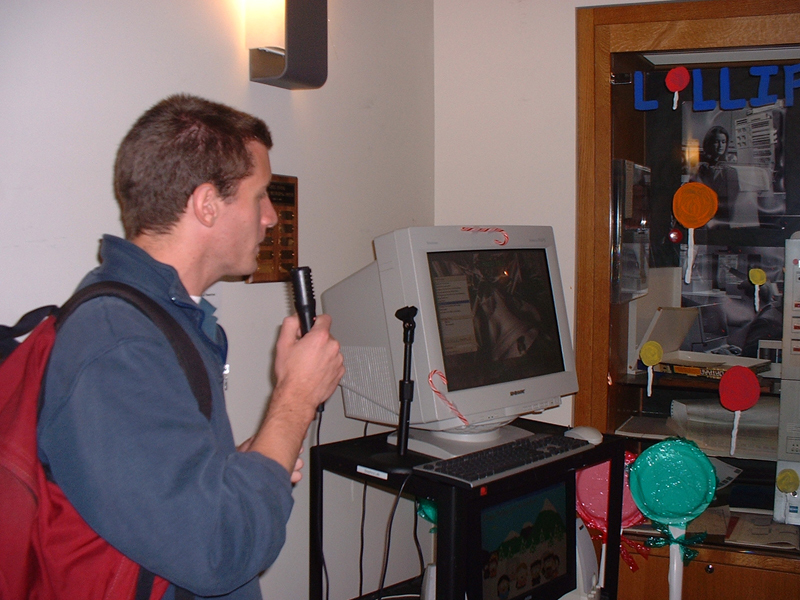 So the Carol-oke software was designed and engineered - primarily by Augusto - to allow users to sing along with MIDI files of Christmas songs. 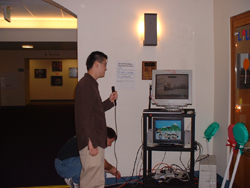 Lyrics are provided, karaoke-style. 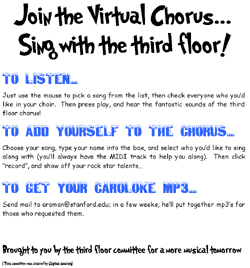 Each user can record himself, and thus add himself to the virtual choir. 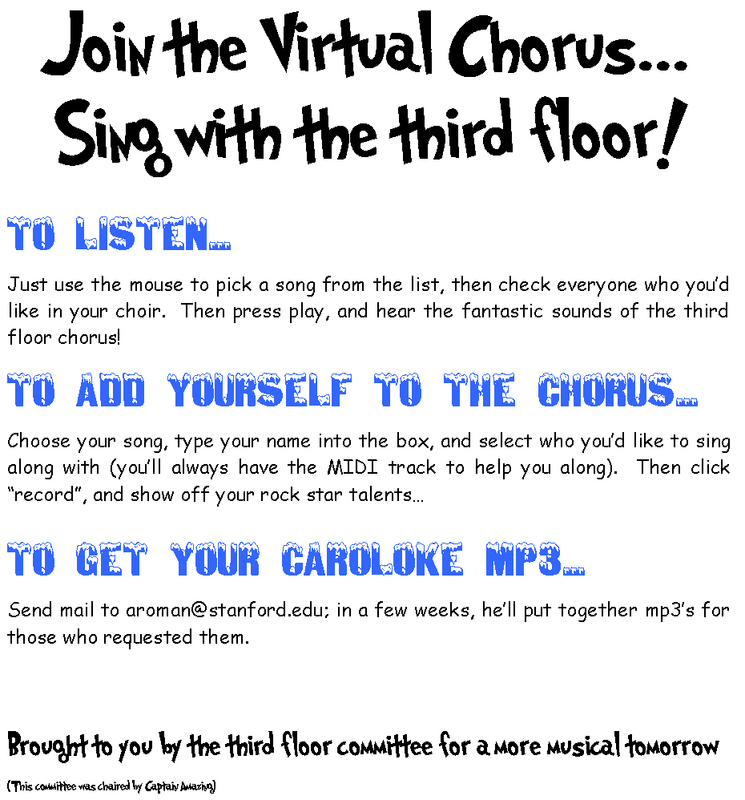 Future users can opt to sing along with any subset of previous carol-ers. Good times. 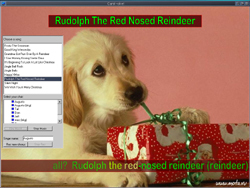 The Carol-oke interface (upper-left) shows Carol-oke in the midst of its most popular hit, "Rudolph". Note the gratuitous and incredibly cute Christmas puppy, one of many charming background scenes. Ron's network plugin (lower-left) has South-Park-ish representations of various third floor personalities singing along with the music. Integration between these apps occurred precisely one hour before the contest. 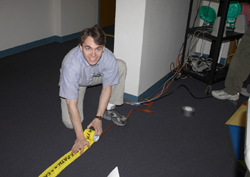 Props to Ron, Augusto, and POSIX-compliant sockets. 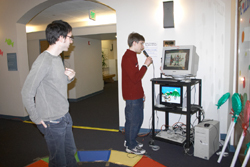 Carol-oke was set up in the Lollipop Woods (aka the corner of the lobby). Getting computers and cables in place was, of course, the last technical hurdle, since compressing to mp3 in real-time and simultaneously decoding 10 or more mp3's required a machine that we couldn't just leave out in the lobby. So we had to lock it safely away, extract the world's largest KVM cable from the world's most inconvenient location, and run cables along the floor. 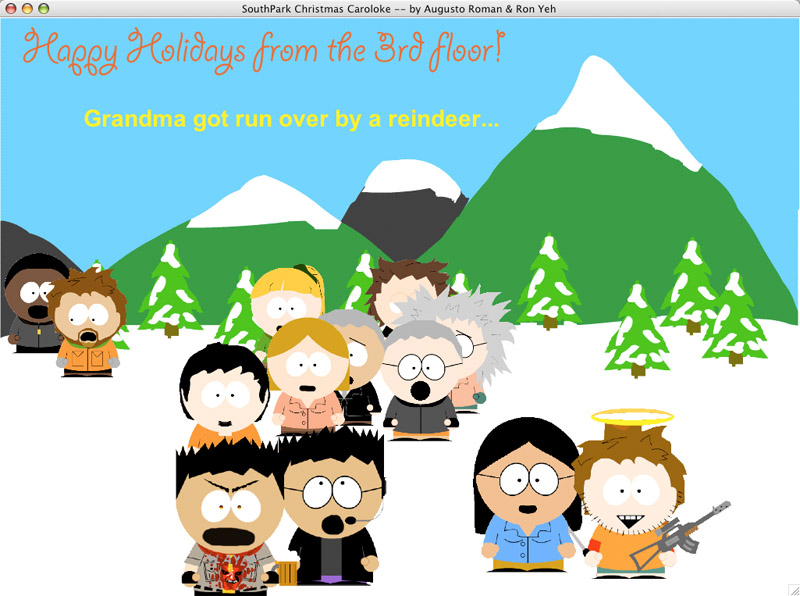 Of course, the bottom line is the profound joy we brought to the carol-oke-ers of the third floor. 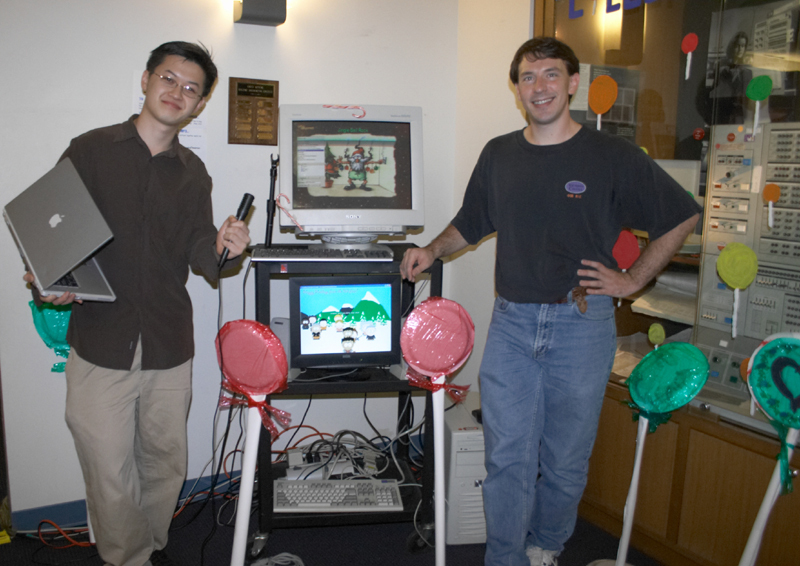 Just look at how much fun they're having! Useful signage instructed folks about how to operator the Carol-oke station, and how they could request their own Carol-oke mp3's after the holidays.